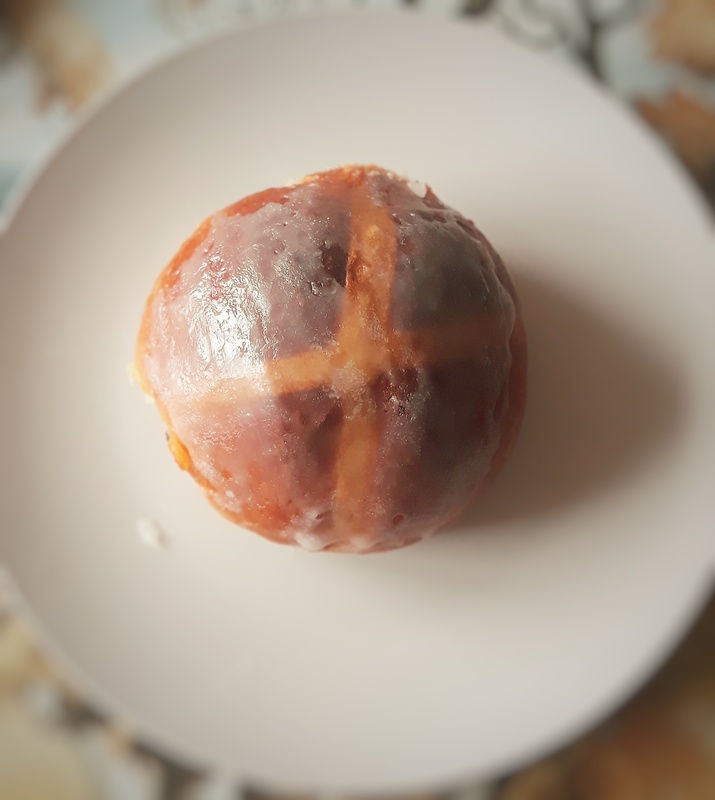 Tomorrow is Good Friday and in England it is traditional to eat hot cross buns, or rather it was; supermarkets and bakeries bring them out as soon as Christmas is over these days. And why not? They are delicious after all. 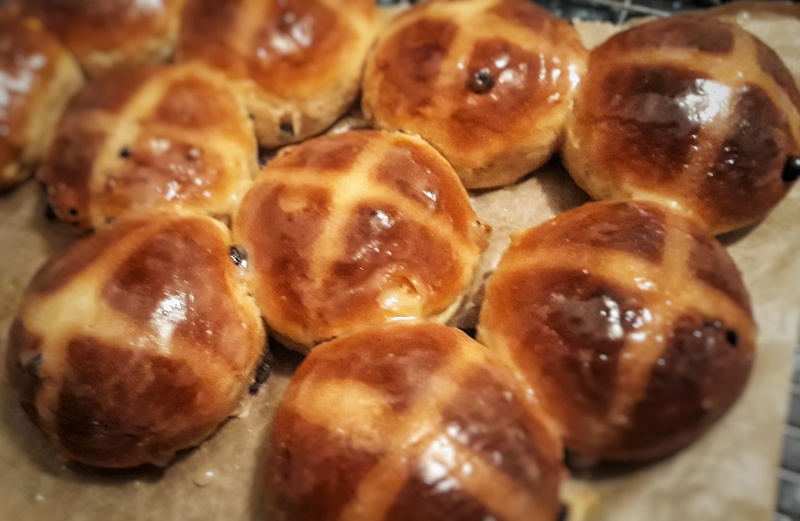 The reason that Good Friday is the day these buns are traditionally baked goes back to Tudor times, when the sale of spiced buns was illegal, except on Good Friday, at Christmas and at funerals. The cross, people assume, is to denote the cross upon which Jesus was crucified. 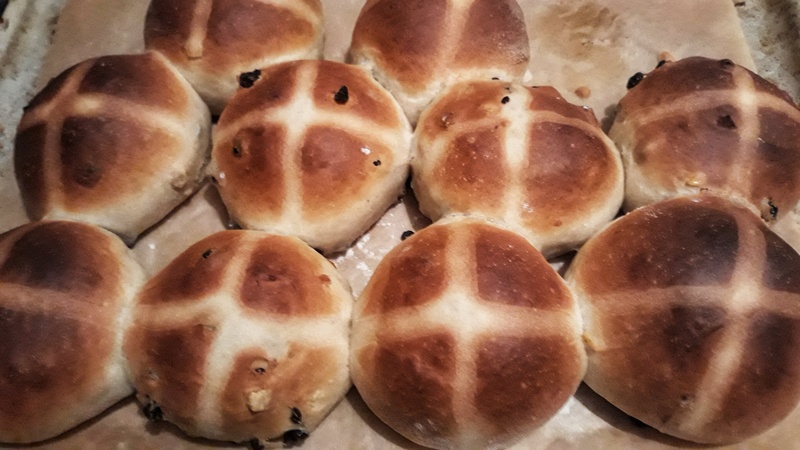 This is in fact nonsense; spiced buns with crosses were being produced throughout much of pagan Europe. 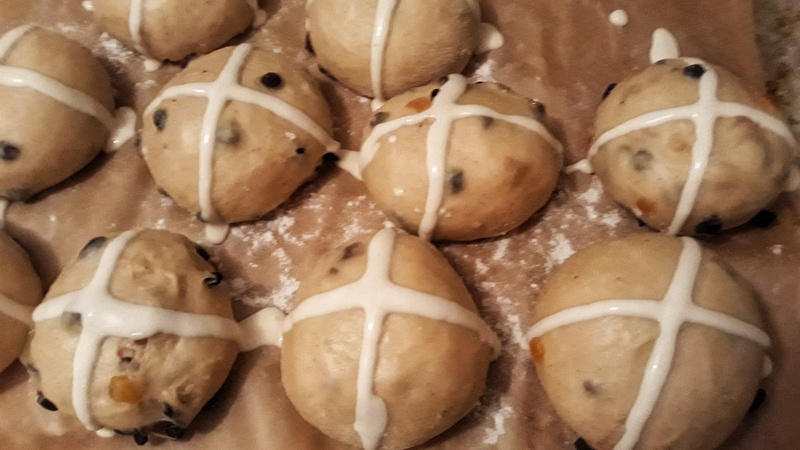 Spiced buns have always been symbolic in worship and ones adorned with crosses were made for the goddess Eostre (where Easter get its name). The recipe below asks for mixed spice, you buy a proprietary blend of course or make your own. I decided to make my own – simply because I didn’t have any. The good thing about making your own is that you can remove spices you don’t like, and enhance the ones you do. Typical spices are the warm ones: cinnamon, mace, allspice (pimento), nutmeg, cloves and ginger. I also think a little black pepper is good. Here’s my recipe. It makes between 8 and 12 buns, depending upon how large you want to make them. The piped pastry cross is optional – cutting crosses with a serrated knife is fine, and closer to the original. I used to think the same as Elizabeth David, in that they ‘involve unnecessary fiddly work’, but that’s because I couldn’t get them right, I reckon to have worked it out now. Mix together the flour, yeast, salt, sugar and mixed spice in a bowl, then make a well in the centre. Beat an egg into the milk, and pour it into the well, adding the butter too. 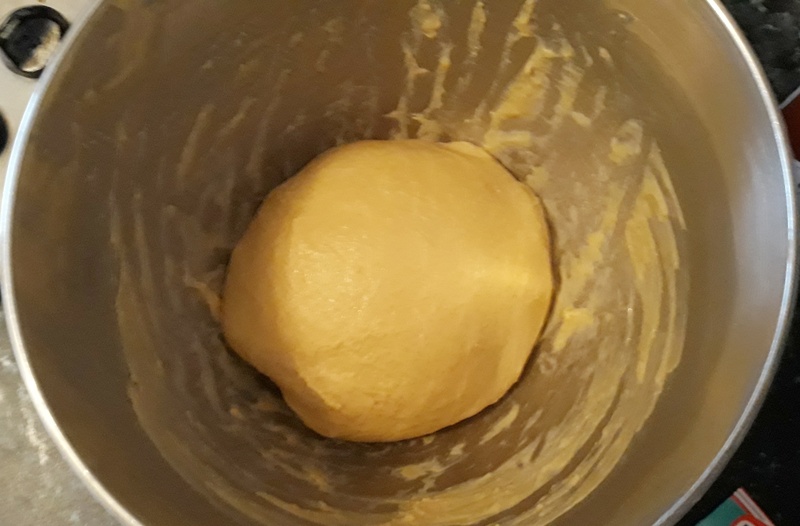 If you have an electric mixer, use the dough-hook attachment and mix slowly until everything is incorporated, then turn the speed up a couple of notches and knead for around 6 minutes. The dough should be tacky, glossy, smooth and stretchy. If you don’t have one, get stuck in with your hands and knead by hand on a lightly-floured worktop. 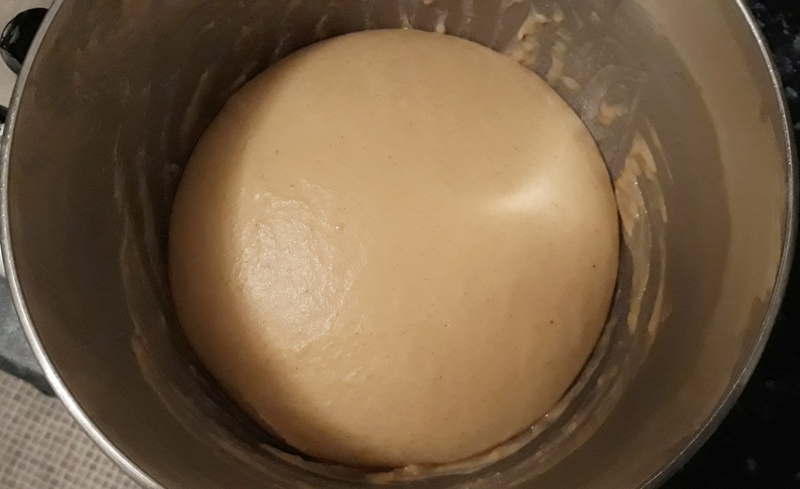 It’s a very sticky dough at first, so it’s a messy job, but it will come together. Grease a bowl, tighten the dough into a ball, pop it in and cover the bowl with cling film or a damp tea towel. Leave to prove until doubled in size – this can take anywhere between 1 and 3 hours, depending upon ambient temperature. 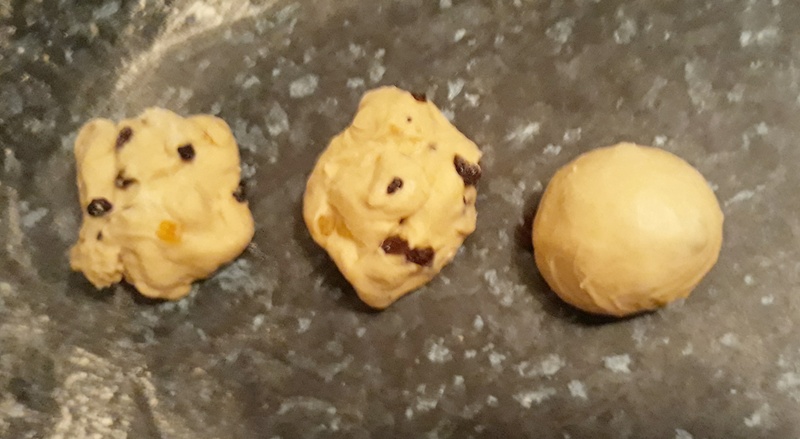 Knock back the dough to remove any air and mix in the dried and candied fruits – again, either by using your hands or your dough hook. Divide the dough into 8, 10 or 12 equally sized pieces and roll up into very tight balls on a very lightly-floured board. This is done by cupping your hand over a ball of dough and rolling it in tight circles, takes a little practise, but is an easy technique to learn. 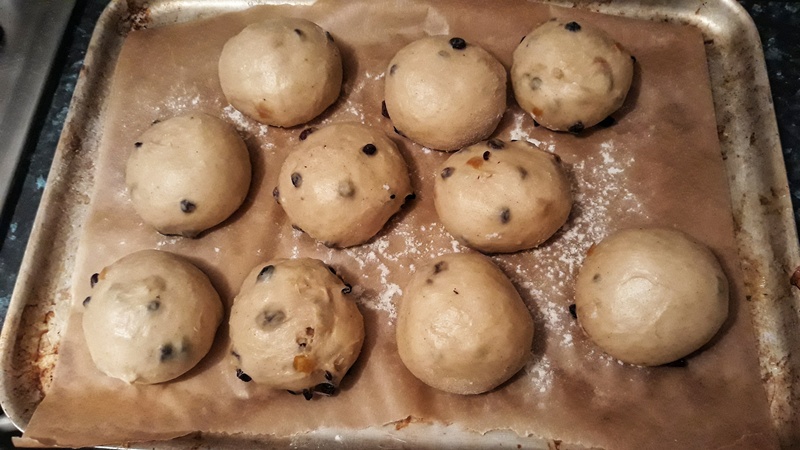 Line a baking tray with greaseproof paper and arrange the buns on it, leaving a good couple of centimetres distance between each one. Cover with a large plastic bag and allow to prove again until they have doubled in size. Meanwhile, make the cross dough. Simply beat the water into the flour to make a loose, but still pipeable batter. Put the batter in a piping bag (or freezer bag, with a corner cut away) and make your crosses. If you like, just cut crosses in the tops. Put the tray in a cold oven, and set it to 200⁰C and bake for 20 to 25 minutes (you get a better rise if they go into a cold/just warm oven, if you have to put them into a hot over, knock 5 minutes from the cooking time). When they are almost ready, make the glaze: boil the sugar and water to a syrup and when the buns come out of the oven, brush them with the glaze twice. Eat, warm or cold with butter. To reheat them, bake in the oven for 10 minutes at 150⁰C. I wondered what was meant by hot cross buns. Thanks. Thanks for busting a widely held myth. Way to go! 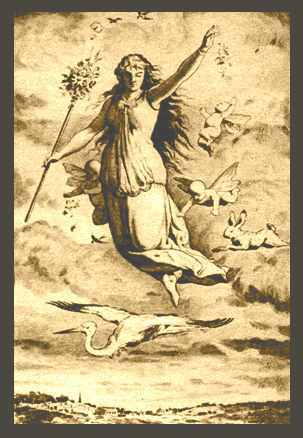 (Aside . . .What spices did we pagans use in the old days? I’d like to get some). I’m still in treacle-mine mode, Neil. What spices did the pagans use in their Eostra buns? I wanna get some. Well the earliest archaeological evidence comes from 1st cetury Greece. The trade routes between there and Asia had been set up a while by that point. So I would go for the spices I listed. Cinnamon, ginger and cloves probably would predominated i think. There wouldn’t have been allspice as that is a New World spice; they’d have to wait 1500 years for that one to pop up. I’m going to make another batch soon with a small proportion of black pepper – I know that Medieval gingerbread recipes included it… I hope that is some help! Well that’s amazing! I always assumed they weren’t used until the Dutch opened up the ‘Spice Islands’. My visits to the exotic spice corner in the market, always a pleasure, have gained a dimension. Interesting version of nursery rhyme – we used to sing ‘One a penny, two a penny . . ‘ but seeing yours makes me think the original version might have been ‘One a ha’p’ny, two a penny . . . ‘ No? I always thought it was ‘one-a-penny…’, but apparently it started off as ‘one-ha’p’ny…’. The rhyme makes much sense if you think about it – it’s about the money you are going to spend rather than the cost of the buns. after all they are one size only, so why should some cost ‘one a penny’ and others ‘two a penny’!? I’m probably totally wrong of course! It sounds like the nursery rhyme could have begun as the street cry of a baker- or baker’s wife with a basket. He/she’d be selling in a farmer’s market these days . . .
they would indeed – the artisan bakery! i have made teacakes, but not for a long time – back when my bread-making skills left alot to be desired. 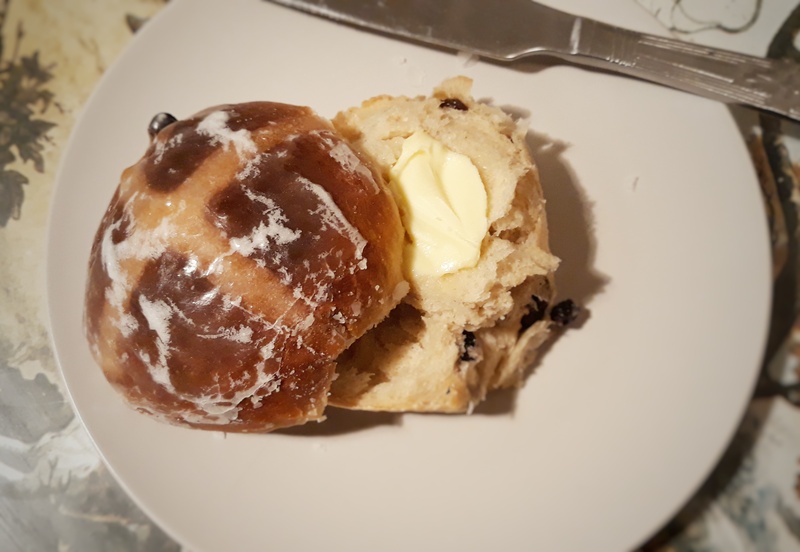 I am thinking of doing some regional recipes soon, Yorkshire shall be first, so there is loads of yeasty things I can do for that… Never tried to do oven bottom bread, but I do like an oven-bottom muffins. I shall add them to the ever-expanding ‘to-do’ list…. I found out I knew very little about these after reading your interesting post. Wonderful information and the recipe is one I will certainly try. Thank you!